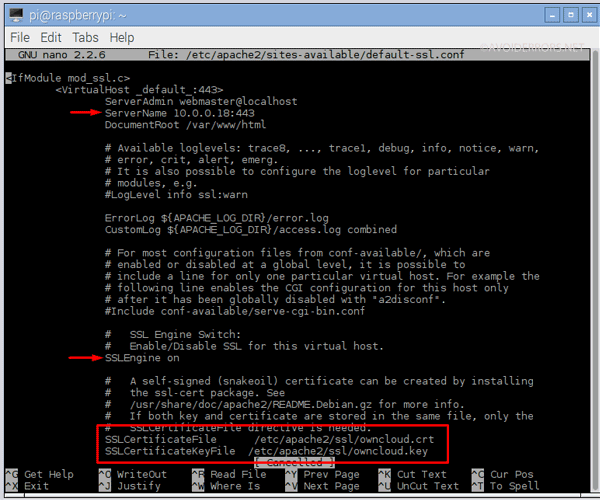 In this post we will learn, how to enable and configure SSL on Owncloud 8 in Ubuntu 14.04 LTS Server. I have already written a post on “How to install Owncloud on Ubuntu 17.04”. Hey this was a fantastic tutorial. I was able to flow it with ease. my connection states still being insecure even after adding the exception: The “Strict-Transport-Security” HTTP header is not configured to at least “15552000” seconds. For enhanced security we recommend enabling HSTS as described in our security tips. Great!!! Worked like a charm! Thank you! Why doesn’t your browser show a warning that the certificate is self signed? Hi, what is the ServerName to put into default-ssl.conf? I tried the IP address with :443 of my Raspi but it resulted in Apache2 not able to restart. Also “LAN IP :443” did not work. When I follow to step 5 command, the result default-ssl conf show “empty conf”, i.e. without any text inside. Could you please advise how to resolve it or reinstall that conf? Look carefully at the copied command, there is probably a space somewhere. Or write the command in stead of copying it. Hi Miguel, you make awesome tutorials. Still I have a problem with SSL, the web says connection is not safe, although antivirus triggers (eset) and I allow the connection, it still doesn’t say it is a safe connection. I have checked portforwarding and rebooted rasperry and router, still is not safe. How could I check if the ssl certificate is valid with another method?